The $100-million wedding of the richest Indian billionaire’s daughter in 2018 is the biggest and most glamorous extravaganza in the history of big fat Indian weddings. It gave a wild run to the imagination of the richest Indian American billionaires too. So unmatched was the opulence from the pre-wedding ceremonies in Jodhpur to the post-wedding events in Mumbai that the nation was left googling for the Isha Ambani wedding costs and goggling at the wedding pictures. It has been only 2 months since the Isha Ambani wedding sent the nation into a tizzy. The wealthiest Indian business family is gearing up for another big fat wedding. 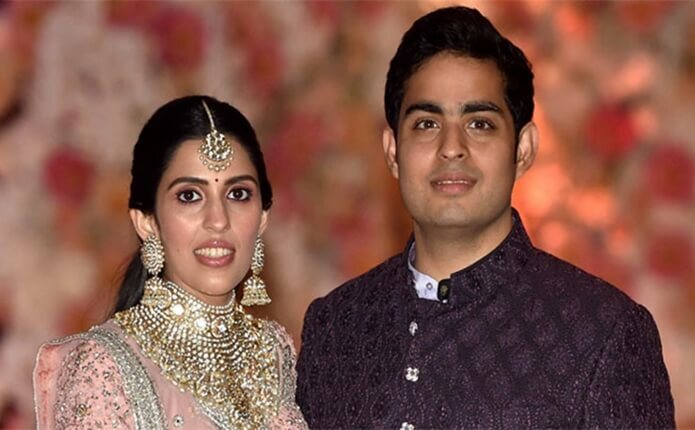 Reliance Industries Chairman, Mukesh Ambani is all set to get his eldest son, Akash Ambani married to Shloka Mehta, the youngest daughter of diamond merchant Russell Mehta in March 2019. Russell Mehta hails from Gujarat like the Ambanis. The Akash Ambani wedding is a 3-day grand event to be followed by a pre-wedding celebration in Switzerland. We at Travel Beats, an overseas Indian community portal by Indian Eagle, wonder at the Akash Ambani wedding expenses and other details. Though Mukesh Ambani’s budget for Akash Ambani’s wedding in March is still a secret, the wedding will not be less extravagant and glittery than the Isha Ambani wedding for sure. Akash Ambani’s engagement invitation card, lavish post-engagement party and the three-tier cake with gold coating hint at the Akash Ambani wedding budget. The Shloka Mehta-Akash Ambani’s engagement card reportedly cost Rs. 1.5 lakh per invitee in 2018. The invitation card was sent in a cream-while box with the edges and the center embellished in gold. The initials of the couple’s first names were engraved in gold on the card. Notably, Isha Ambani’s wedding card was priced at a whopping Rs. 3 lakh each. Approximate Rs. 2 lakh was the price of the cake for Akash Ambani’s post-engagement party at Antilia in Mumbai. Evidently, the Akash-Ambani wedding expenses would run high. Asia’s richest business tycoon, Mukesh Ambani has planned his son’s wedding as a 3-day event. The Shloka Mehta-Akash Ambani wedding will be solemnized on March 9 at the Jio World Center in Bandra Kurla Complex. The bridegroom party (Mangal Baarat) will leave for the venue from Trident Hotel in Mumbai. It will be followed by the Mangal Parv ceremony next day at the same venue. The Mangal Parv is expected to be a lavish bash for the Ambanis’ acquaintances from different walks of life, including entertainment and politics at home and abroad. The Akash Ambani-Shloka Mehta’s wedding reception will take place on March 11. The guest list of Akash Ambani’s wedding is still under the carpet. Isha Ambani’s wedding was graced by crème de la crème from the United States and other parts of the world, including Hillary Clinton and John Kerry. Needless to say, the same or a similar guest list of celebrities and luminaries will be the cherry on the Akash-Ambani wedding cake. Obviously, several business flights from USA to India will be booked for the wedding. American pop star, Beyonce set fire to the stage of Isha Ambani’s pre-wedding ceremonies, with her electrifying performance for Rs. 15 crore ($2.1 million). We’re wondering who will be the star of the show this time. St Moritz in Switzerland is the destination for the Shloka Mehta-Akash Ambani’s pre-wedding celebrations, including their bachelor parties, on February 23, 24 and 25. The Swiss town will witness the arrival of over 500 guests for the bashes. Two planes carrying the guests will take off for St Moritz from Mumbai. Akash Ambani’s close friends including Ranbir Kapoor is on the guest list for the pre-wedding parties in Switzerland. Shloka Mehta and Akash Ambani have been friends since their days at Dhiru Bhai Ambani International School. She studied anthropology at Princeton University in New Jersey, USA and earned a master’s degree in law from London School of Economics. Media took fancy to her after she got engaged to Akash Ambani in Goa. She currently heads the board of Rosy Blue Foundation, the philanthropic arm of his father’s diamond business. Shloka Mehta possesses a stellar collection of cars, which includes a mini chopper, a Bentley and a Mercedes Benz. She is an animal lover too. Travel Beats, a subsidiary of Indian Eagle Travel, publishes latest visa, immigration, passport, aviation and Indian community stories. A trusted travel booking partner of Indians in USA, Indian Eagle has a proven track record in booking cheap business flight tickets from USA round the year. What a shameful and a wasteful show. Please consider the extreme poverty in Indian villages and act a bit consideration for them. Studying anthropology and collecting cars, is hardly a useful accomplishment. What a disgrace and shame for people having all the education from Universities in the world . Let us stop publicizing this behavior in a poor society like India. Education means upliftment of mind and soul and social behavor. good luck to the new couple. god bless them and have a wondwerful life. If i get an invitation from ambani family i will love to attend there weeding. 1. NO MONEY is being wasted ! What they spend will be earned by hotels, airlines, clothiers, jewelers, and many others. 2. All them people who are cribbing about poverty etc. My question to you is WHAT HAVE U DONE ? 3. Being rich is no crime . Plus, isn’t that what you want . 4. Most people work hard so that their FAMILIES can have what YOU dream of. 5. Those who could not reach Ambanis level are crying foul ????? SOUR GRAPES !!!!!!!!!!!! Msg for loosers: LEARN from them and become something .